Notre-Dame Cathedral in Paris is famous for its intricate gothic-style design and for its aesthetic grandeur and harmony. On a first visit, many of the small details are easy to miss, so here's a guide to help you focus your visit, and understand the basic elements of gothic architecture. Notre Dame's iconic facade is recognized across the world, as it ends up the most on postcards and in travel guides. There is a reason for this: the facade shows a distinct harmony of design, and represents a level of detailed craftsmanship that perhaps no longer exists in contemporary architecture. From Notre Dame's vast plaza, designed by Haussmann in the 19th century, you can procure a stunning view of the facade's three elaborately-decorated portals. Though the portals were conceived in the 13th century, much of the statuary and carvings were destroyed and later replicated. Also, note that the portals are not entirely symmetrical. Perfect symmetry was not always considered important by medieval architects. The left-side Portal of the Virgin depicts the life of the Virgin Mary, as well as a coronation scene and an astrological calendar. The central portal depicts the Last Judgement in a kind of vertical triptych. The first and second panels show the resurrection of the dead, the judgment, Christ, and apostles. A reigning Christ crowns the scene. The Portal of Saint-Anne on the right side features Notre Dame's oldest and finest surviving statuary (12th century) and depicts the Virgin Mary sitting on a throne, the Christ child in her arms. Above the portals is the gallery of kings, a series of 28 statues of the kings of Israel. The statues are replicas: the originals were decapitated during the revolution and can be viewed at the nearby Medieval Museum at the Hôtel de Cluny. Step back and settle your eyes on the magnificent exterior of Notre Dame's West rose window. Measuring 10 meters in diameter ( 32.8 feet), it was the largest rose window ever attempted when it was conceived. Look closely and you'll see statuary depicting the biblical figures of Adam and Eve on the outer rim. The final level of the facade before reaching the towers is the "Grande Galerie" which connects the two towers at their bases. Fierce demons and birds decorate the grand gallery but are not easily visible from the ground. Notre Dame's imposing and ornate towers became a legend thanks to 19th-century novelist Victor Hugo, who invented a hunchback named Quasimodo and had him inhabit the South tower in "The Hunchback of Notre Dame". The towers plunge upward for 68 meters (223 ft.), offering noteworthy views of the Ile de la cité, the Seine, and the entire city. First, though, you'll need to climb nearly 400 stairs. Once at the top, reward yourself by admiring statues of grimacing demons and menacing carrion birds. The South tower houses Notre Dame's infamous 13-ton bell. You can also admire the detail of Notre Dame's magnificent spire, destroyed during the revolution and restored by Viollet-le-Duc. Often neglected by visitors, Notre Dame's North, South, and rear facades offer unique and poetic perspectives of the cathedral. The Northside (around the left from the main facade) features a portal with a stunning 13th-century statue of the Virgin Mary. Unfortunately, the Christ child she is holding was decapitated by 18th-century revolutionaries and never restored. The rear facade is arguably just as beautiful as the main facade and dramatically displays Notre Dame's flying buttresses and decidedly gothic spire. Finally, the Southside (around the right from the main facade) features the Saint-Etienne Portal, depicting the life and works of the saint of the same name and displaying elaborate sculptures. A gate closes off this side of the cathedral, however, making photo opportunities less interesting. 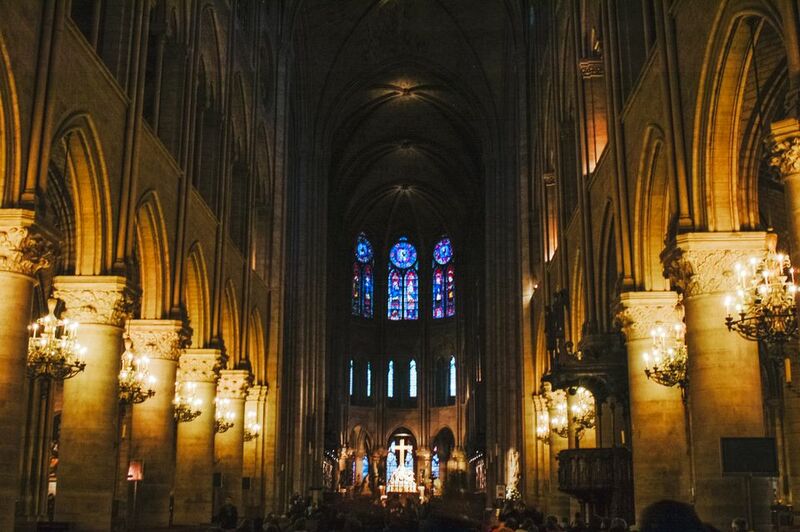 Medieval architects represented their idea of human earthliness in relation to heaven through structures that were at once grandiose and ethereal--and Notre Dame's interior achieves exactly this. The cathedral's long halls, vaulted ceilings, and soft light filtered through intricate stained glass help us understand the medieval perspective of humanity and divinity. There is no access to the cathedral's upper levels, obliging visitors to remain earthbound, gazing upward. The experience is breathtaking, especially on a first visit. The cathedral's three stained-glass rose windows are the interior's outstanding feature. Two are found in the transept: the North rose window dates to the 13th century and is widely considered to be the most stunning. It depicts Old Testament figures surrounding the Virgin Mary. The South rose window, meanwhile, depicts the Christ surrounded by saints and angels. More modern stained glass, dating to as late as 1965, is also visible around the cathedral. Notre Dame's organs were restored in the 1990's and are among the largest in France. Try visiting during a mass to witness some astonishing acoustics. Near the rear, Notre Dame's treasury includes precious objects, such as crosses and crowns, made of gold and other materials. After completing your visit of the cathedral, you can dig deeper by visiting the archaeological crypt at Notre-Dame. Here you can discover parts of the medieval wall that once surrounded Paris, as well and learning about the Gallo-Roman and early Christian places of worship that once stood on Notre Dame's foundations. Located just north of Paris, the magnificent St-Denis Cathedral Basilica was constructed even earlier than Notre Dame and is home to an astounding necropolis housing recumbent effigies and tombs of dozens of French kings, queens, and royal figures, as well as the crypt of the famous eponymous saint himself. Strangely, many tourists never hear about St-Denis at all, so make sure to reserve some time for a day trip from Paris there.